After you carve your jack-o’-lantern, don’t toss out those seeds. Clean them up and roast them with a little hint of flavor for a nutritious fall snack. If your mom used to roast the pumpkin seeds she took out of your jack-o’-lantern like many of ours did, you’re probably a fan of the toasty, nutty flavor just like we are. 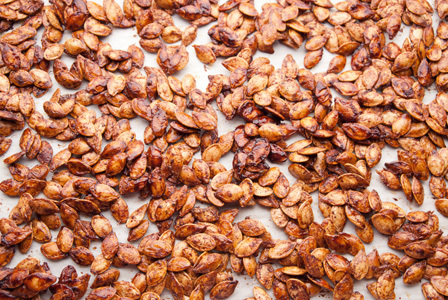 Put a little flavor in that traditional roast by trying one of these recipes for gourmet seeds. Heat the oil over medium heat in a cast-iron or other heavy skillet for about five minutes. The oil is ready when a single drop of water sizzles on contact. Brown the seeds. Do not leave them unattended, as they burn quickly after browning. Remove the pan from the heat. Add the lime juice and stir until it has evaporated. Add the other ingredients, stir and allow them to cool completely. Place water and pumpkin seeds in a pot on the burner and bring to a boil (do not add the pumpkin seeds after the water begins to boil — they must go into a cold pot of water). Allow them to boil for about 10 minutes, then drain (do not rinse). Spread them out in a shallow, foil-lined baking dish and allow them to dry for 30 to 45 minutes. Patting them dry with a paper towel helps speed up the process. In a microwave-safe bowl large enough to hold the seeds, melt the butter. Temporarily transfer the dried seeds into the butter bowl and add the remaining ingredients, stirring to ensure each seed is well-coated. Spread them back out into the baking dish in a single layer and bake for about an hour, stirring several times throughout the process to ensure each side is toasted and crunchy. Add extra salt and sugar to taste. Bring the mixture to a simmer and cook for 15 to 20 minutes (the seeds will begin to turn gray in the middle, which is normal). Drain the seeds and spread them on a shallow, foil-lined baking sheet in a single layer. Bake for 1 to 1-1/2 hours until the seeds are crisp and browned.